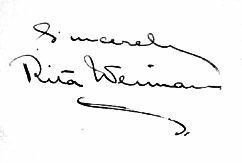 The author Rita Weiman had her greatest successes in the 20s when a lot of her works were also adopted for the cinema. The first book was filmed in 1917 when director Ralph Ince realised the movie "The Co-respondent" (17). In the next years followed several other film adaption, among them "Madame Peacock" (20) with Alla Nazimova, "Curtain" (20) with Katherine MacDonald, "Footlights" (21) with Reginald Denny, "After the Show" (21) with Jack Holt and Lila Lee, "The Grim Comedian" (21) again with Jack Holt directed by Frank Lloyd, "Rouged Lips" (23) with Viola Dana and Tom Moore, "The Social Code" (23) with Viola Dana and Huntley Gordon, "The Acquittal" (23) with Claire Windsor, "The Whispered Name" (24) with Ruth Clifford, "Bluff" (24) with Agnes Ayres and Antonio Moreno, "The Spotlight" (27) with Esther Ralston, Neil Hamilton and Arlette Marchal directed by Frank Tuttle as well as "Two Masters" (28) with Paul Harvey. Afterwards the filmings of her books diminished, still her works offered material for cinema and television till to the 50s, especially television in the 50s used her books for more filmings. To these movies belong "On Your Back" (30) with Irene Rich and H. B. Warner, "The Witness Chair" (36) with Walter Abel, Margaret Hamilton and Ann Harding, "The President's Mystery" (36) with Henry Wilcoxon, Sidney Blackmer and Evelyn Brent, "Possession" (47) directed by Curtis Bernhardt with Joan Crawford, Van Heflin and Raymond Massey and an episode of the serial "Studio One: Mist with the Tamara Geba" (50).